The Play menu allows you to play games against the computer and perform operations on a game in progress or view played games and ratings. Please note the shortcut keystroke for common operations are also defined on the menu, you can use the keyboard shortcut to invoke the associated function directly from the keyboard. You can also see shortcut icons for some menu items on the menu as a guide that there is a shortcut toolbar icon for the option. This menu item allows you to start a new game to play against the computer, it opens the Play new game dialog so you can set the conditions for the game. This menu item allows you to play a new game against the computer from the current position. This new menu item allows you to start a new engine match where chess engines will play each other. This opens the Engine match dialog. This feature was added in v1.7. This menu item allows you to takeback a move during the game. It takes back both the computers response and your last move. This menu item allows you to replay the next move in the game. Clearly this can only happen after a takeback so there is a next move. It replays both your next move and the computers response. This menu item allows you to change sides with the computer. Please note for rated games if you want an accurate chess rating we suggest you do not use this option. 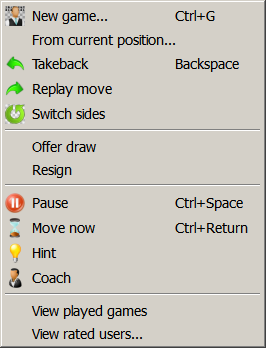 This menu item allows you to offer a draw to the computer. The computer will consider your draw offer and either agree to the draw or refuse it and choose to play on. This menu item allows you to resign the game. Your opponent will be awarded the win. This menu item allows you to pause the current game, the clocks will be paused. You can resume the game by selecting this menu item in paused game condition and the clocks will restart. Very useful if you need a break during the game. This menu item forces the computer to stop thinking and make its move. It only has an effect if the computer is thinking. This menu item requests a hint move from the computer. The hint move with be animated on the board so you can see what move the computer is suggesting. This menu item allows you to toggle the coach on or off. When on the coach will warn you if it thinks your move might be a serious mistake and the coach can even alert you to the possibility that you may of missed a very strong move. This menu item will open the PlayedGames PGN database in a separate database tab so you can view games you have already played against the computer. This menu item will open the EngineGames PGN database in a separate database tab so you can view games already played between engines. This menu item will open the Rated users dialog where you can view the current chess ratings of players who have played games in HIARCS Chess Explorer.